In the early 2000’s, there was a team with nearly unlimited campus access that was in the field, assisting struggling campuses improve student performance. In addition to this significant charge, the team was also searching for what the great schools were doing differently. But not “great” as measured by high test scores. Instead, great, as measured by a school outperforming its peers. And the team did discover what the great schools were doing differently. But that is not the story. During the search for what the great schools were doing differently, it did not take the team long to realize that though it was not a common occurrence, it was not unusual to visit a campus and find an exceptional teacher. A teacher that in spite of the overall performance of the campus was having noticeably more success than that of the overall staff. Success that was not driven by who or what the teacher was teaching. Success that seemed to be the result of some magical “It” factor. An “It” that some teachers had, and the rest of us did not. After 1,000’s of classroom observations here is what the team discovered. These great teachers were not doing anything extraordinary. Instead, they were doing the ordinary…. extraordinarily well! These great teachers were using the solid instructional practices that we all know about, talk about, and plan to do… occasionally. But the great teachers were not thinking and talking about best practices, they were actually using them. Lesson after lesson. Day after day. Week after week. Month after month. And not only were they using these practices more often than all the rest of us, but due to the fact that they used them so often, they were also doing them better. This might sound like bad news, but it is really great news. Because this meant to be a great teacher, you didn’t have to be born with some magical “It.” Instead, it meant all of us can make ourselves great. These great teachers that the team was studying were not teaching dramatically different than all the rest of us. They were teaching slightly different. But those slight differences in delivery were making a dramatic impact on student performance. Regardless of content, grade level, or student ability. That is the story. We did not invent The Fundamental 5. We found a pattern. The Fundamental 5 is a pattern of delivered instructional practices that improve teacher effectiveness and increases student performance. 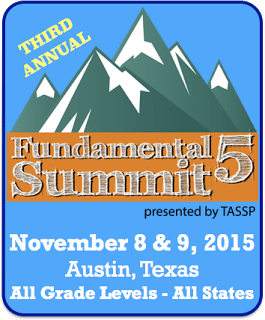 Come to The 3rd Annual Fundamental 5 Summit in Austin, Texas on November 8 and 9, 2015 and join K-12 educators from across the country as they share how they have used the instructional practices spotlighted in The Fundamental 5 to dramatically improve the academic performance of their students (from the most at-risk to the highest achieving) and the success of their schools. It is the most exciting and most real conference of the year and I hope to see you there. Brezina Writes – Middle Ground?